There are many different elements at play with video production. Therefore, before contacting a video production company you need to think about the services that you will need. 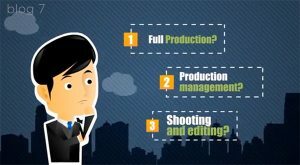 Do you require full production services for your video? Are you looking for the video company to manage all facets of the video production? Or are you simply looking for them to provide more technical services such as recording the video and then editing it to your liking? You also need to factor in the components that are going to be done internally in your company. What role will your company play in the production of the video? • Post production and editing services? Key Takeaway: Understanding the video production services that are required will help the video company better establish their role for the project.